Helping build impermeable concrete structures is a PENETRON specialty. The newly opened Charles Perkins Building showed Sydney University project managers just how effective PENETRON crystalline technology can be. Award-winning design: The new Charles Perkins Centre is a state-of-the-art research and education facility and also part of a regional medical research network in Australia. The immediate success of the PENETRON treatment on the shotcrete walls at Sydney University is further proof of the effectiveness of the PENETRON crystalline technology in reducing permeability, even under high hydrostatic pressure. 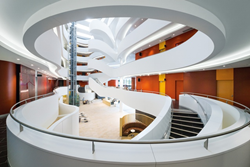 Located on the Camperdown campus of Sydney University, the new Charles Perkins Centre is part of a regional research and education network connected to medical research institutes and hospitals. This A$385 million project resulted in state-of-the-art facilities and infrastructure for more than 1,500 undergraduate students and 900 researchers and post-grad students. Designed by Durbach Block Jaggers Architects & BVN, the Charles Perkins Centre won the Australian Institute of Architects’ NSW Architecture Award 2015 (William E Kemp Award for Educational Architecture) and was a runner-up in the World Building of the Year 2015 competition in the higher education and research category. This job was one of the major upgrade projects for the Sydney University Campus in recent memory. With a footprint of approximately 4,500 m2 (48,450 square feet) and with 4 below-ground floors and 7 above-ground floors, extensive shotcrete walls were initially placed on perimeter secant piling at the job site to create space for the actual construction of the building. The concrete repair process was carried out by the Superseal Group. PENEPLUG was used to immediately stop the large, active leaks. PENECRETE MORTAR was then drypacked into routed channels to seal the cracks. Finally, PENETRON crystalline slurry was applied to the surface as a final coat over the entire repaired area. “The immediate success of the PENETRON treatment on the shotcrete walls at Sydney University is further proof of the effectiveness of the PENETRON crystalline technology in reducing permeability, even under high hydrostatic pressure,” adds Mr. Van Beeck. An initial application of PENETRON shotcrete walls on perimeter secant piling created space for construction. Concrete repair with PENETRON to seal the concrete foundation structures followed.